A consultant group serving as the “External Compliance Monitor” for the 2022 FIFA World Cup released its second annual report on Wednesday detailing labor conditions at construction sites in Qatar. The tone of the accompanying press release is positive, touting “a new spirit” and labor law reforms (which are mostly yet to be fully implemented) that are an improvement on horrendous conditions that the International Trade Union Confederation, in 2014, projected could kill 4,000 migrant workers. The report doesn’t note the number of deaths at World Cup construction sites in the past year (though one worker suffered a 130-foot lethal fall just last month), but focuses instead on the socio-economic status of workers and violations involving working hours and rest. It should be noted that this construction work is not only physically demanding, but typically done outside in temperatures that, depending on the time of year, can reach as high as 120 degrees. Working every single day for up to five months in those conditions is obviously extremely dangerous, and no one has the right to be shocked if it leads to an worker’s death. 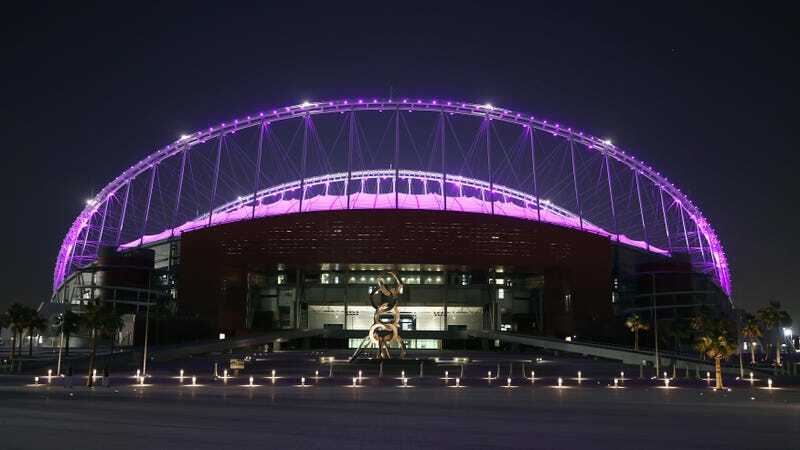 This Slave-Built Qatari World Cup Stadium Sure Is Pretty!